Scientists at the La Jolla Institute for Allergy and Immunology say they have demonstrated that TET (ten-eleven translocation) proteins collectively constitute a major class of tumor suppressors and are required to maintain genome stability. 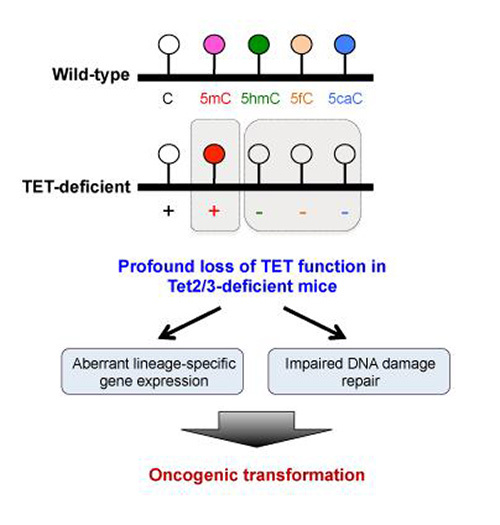 Their study (“Acute loss of TET function results in aggressive myeloid cancer”), published in Nature Communications, shows that mice lacking both Tet2 and Tet3 rapidly develop an aggressive form of myeloid leukemia. The researchers believe that a better understanding of genome instability may open new avenues for treating cancer. Members of the TET family of enzymes help rewrite the epigenome and help determine gene activity without changing the genetic code. Specifically, TET enzymes convert a modified form of cytosine, 5-methylcytosine (5mC) to 5-hydroxymethylcytosine (5hmC) and other forms of oxidized methylcytosine. Together these oxidized forms of 5mC facilitate DNA demethylation but are also important in their own right. “One possibility is that the precipitating factor is loss of oxidized methylcytosines rather than changes in DNA methylation per se,” adds Dr. Rao. Deleting just one of the three members of the TET family (Tet1, Tet2 and Tet3), although insufficient to induce full-blown leukemia in a model system, leads to the expansion of the stem cells that give rise to all blood cells. This process is exacerbated in stem cells with more severely impaired TET function, such as that seen in this study in mice lacking both Tet2 and Tet3. The capacity for self-renewal is enhanced and the cells preferentially differentiate into cells belonging to the myeloid lineage, such as macrophages and neutrophils.